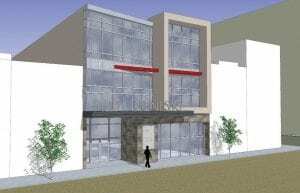 An artists depiction of the proposed Genesys Downtown Health Center, scheduled to be opened in July 2013. FLINT — After a comprehensive assessment of the community’s current and future health care needs, Genesys plans to open a facility in downtown Flint. Genesys is partnering with Genesee Regional Chamber of Commerce, Uptown Reinvestment Corporation and Uptown Developments to open the Genesys Downtown Flint Health Center at 420 S. Saginaw Street. The facility is scheduled to open July 2013. “By opening this facility, Genesys is bringing the right level of medical care to the right population in the right location,” reports Elizabeth Aderholdt, Genesys Health System president and CEO, who, along with Tim Herman, Genesee Regional Chamber of Commerce CEO, made the announcement of this initiative at a press conference held recently at the Chamber. The facility provides easy access for students, those who use public transportation and those who live and work nearby, Aderholdt points out. “The Genesys Downtown Flint Health Center is our promise to the residents of Flint that we are here, not only to keep you healthy, but to share in a vital partnership to revitalize this community, to help it grow and flourish … today, tomorrow and for future generations,” said Aderholdt. Genesys is making a $3 million investment over seven years to open this facility. Approximately 60 employees from the Genesys West Flint Health Center will move to the new location, and Genesys hopes to create at least 10 more jobs. As the need for health care services increases in the city, Genesys anticipates offering more employment opportunities.